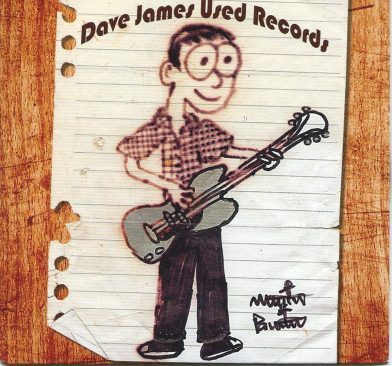 Dave James’ Used Records is an unusual amalgamation of musical styles that combines acerbic wit and a wry sense of humor. Interspersed throughout are three short instrumental passages that keep you wondering where James is headed next. The engaging and rhythmic “Everybody Has A Tattoo” is a good choice to open the record, and it gives new meaning to the phrase “I’ll show you mine if you show me yours.” There’s a solid bass line driving the bubblegum pop instrumentation that leads to a nice twin guitar solo. “The Saddest Girl in the World” is moody and atmospheric and James does a nice job lyrically of capturing the desolation of the subject matter. “Product” starts off conjuring images of Gram Parsons before James slides into a bouncy good feel that would be a perfect accompaniment to any number of products sold. At this point, James throws a curve ball with “Die Contract,” the first of three instrumental passages. The haunting and psychedelic organ is accompanied by sparse acoustic strumming before dissolving into a brief moment of chaos as it fades into “Mrs. Reynolds.” James and company land on terra firma and deliver a solid song that would fit nicely on any number of records by the Continental Drifters; and unlike the closing refrain, listeners will certainly want to feel this way again. James changes things up with “Sometimes I Worry,” delivering a solid blues-rock song that fans of Dave Jordan will find appealing. Both “Yoga Cult” and “Mongolia” somehow remind me of early Phish. There’s something about the opening vocal passages and the humorous anecdotes contained within that seem to warrant the comparison, but your mileage may vary. Overall Used Records is a solid outing that covers a lot of ground in a short period of time.